The 2020 Olympic Games are set to be the most equal Olympics yet, and by that, I mean that there will be more gender equality in terms of events offered at the Olympic Games than ever before. Throughout the history of the modern Olympic Games, gender equality has always been an issue, but it’s not an issue that is solely attributed to the Olympic Games or the International Olympic Committee themselves, but more toward the wider societal perceptions of sport in reflection of gender roles overall. This can be seen all throughout the history of the games. For example, despite the first games taking place in 1896. The first females to participate at the Olympic Games was in 1900 where 22 women took part in Tennis, Golf, Sailing and Croquet. Despite being a male dominated event, women’s participation at the Olympics continued to grow in number of participants as well as different sports and events. However, most women were limited to compete in sports that would be considered more “feminine” and often times prohibited in competing in sports deemed more “masculine.” It wasn’t until 1984 that a female division of the Olympic marathon was added, 2000 when women could compete in weightlifting, 2002 for bobsled, 2004 for wrestling and 2012 for boxing. In certain sports such as Swimming and Athletics there have been different events for men and women, however for 2020 this gap is slowly closing. Specifically, in swimming where the women’s 1500m and the Men’s 800m will be contested for the first time as well as the Mixed Relay which is a relay event consisting of 2 male and 2 female swimmers. These events have long been part of other large international swimming events including the World Championships but never before at the Olympic Games themselves. While there are still many gender differences within all sports at the Olympics, with many events contested specifically for one gender but not another. For most of the history, the focus on gender equality in sport has been focused on building female participation in sports traditionally considered “masculine” and dispelling a lot of stereotypes and pseudoscience that have held women back from taking part. At the 2016 Olympic Games, women could take part in every sport that men could even if the events within that sport aren’t fully equal. However, there are still two sports on the entire Olympic program that are exclusive to one gender. Rhythmic Gymnastics and Synchronized Swimming. These sports are open to women, but men are banned from competing because of the perceived “femininity” that is exclusive to these sports. We are still on the road toward gender equality at the Olympic Games. Where men have been discouraged to take part in certain artistic sports that are traditionally more feminine. In sports such as gymnastics and figure skating, the men’s competition is significantly different than the women’s to try and diminish the “femininity” of the sport. This is why you have events like the Pommel Horse, Rings and Parallel Bars for men but not for women. Even the women’s floor routine is more artistic with elements of dance added in whereas the men’s routine rarely utilizes music at all. You might argue that is because physiologically women have less upper body strength. Yet, women’s events such as the uneven bars and vault still require a strong and trained upper body that female gymnasts already have. Even in Figure Skating, there is a reason why completing a Triple Axel is a guarantee medal in the women’s competition whereas it won’t even get you into the top 10 for the men’s. In a sport that emphasizes femininity, the men’s division has been driving to be more athletic rather than artistic. Men were first allowed to compete at the Synchronized Swimming World Championships in 2015 in the Mixed Duet Division where USA Athlete Bill May with his partner Christina Jones and Aleksandr Maltsev with his partner Darina Valitova became the first men to win a gold medal in synchronized swimming at the world championships. Men were not allowed to compete in any solo or male only events. At the 2017 World Championships, there was a Mixed Duet and a Mixed Teams division only. One of the few places where Men can fully compete in all synchronized swimming events is currently at the International Gay and Lesbian Aquatics recognized and sanctioned events, including the Gay Games which have helped build male participation in the sport. Sport is a form of self-expression for the dedicated athletes who put in the time, money and effort to train to be their best. Expressing yourself in sport is showing the world a part of who you are and what you are capable of achieving. Being an athlete however, doesn’t define you or limit you to a certain standard. Athleticism is the desire of an individual to express themselves through a physical capability, just as a singer or musician would express themselves through music. This form of self-expression isn’t defined by anybody else but the individual themselves. Thus we shouldn’t limit people to strict definitions of something that they may not choose to represent. It is time that we stop looking at gender divisions as solely masculine or feminine but recognize and accept that men can be just as much feminine as women can be masculine. There is nothing wrong with either and we shouldn’t define our skill set and athleticism on the grounds of gender roles. 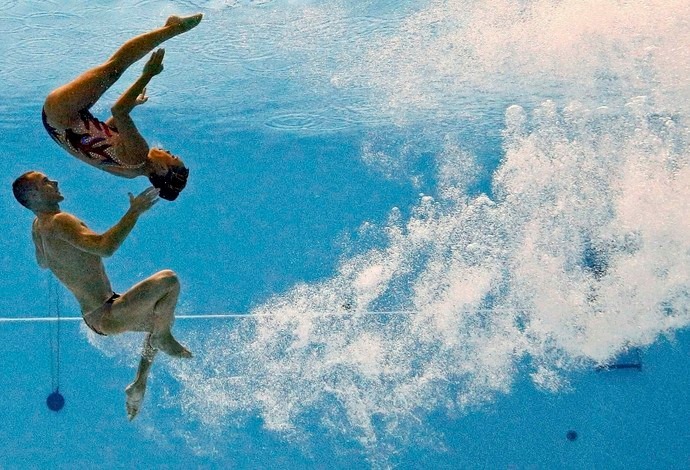 It is time to add a men’s division of Synchronized Swimming and Rhythmic Gymnastics to the Olympic Program.